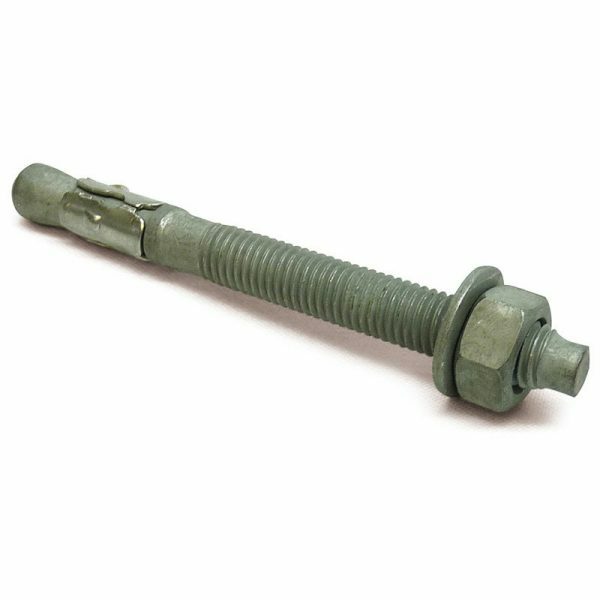 Hot Dip Galvanised bolt with stainless steel expansion clip for long life in external applications. An economical fixing, they achieve good loads and are quick and easy to install. They have the advantage of being through fixings with the drill size being the same diameter as the anchor . They are simply hammered into the hole and tightened to draw the cone into the expansion clip. 0247337 M8 x 75 5mm Speak to a specialist on 0115 922 1585. 0247345 M8 x 95 30mm Speak to a specialist on 0115 922 1585. 0247435 M10 x 70 5mm Speak to a specialist on 0115 922 1585. 0247445 M10 x 85 10mm Speak to a specialist on 0115 922 1585. 0247454 M10 x 125 50mm Speak to a specialist on 0115 922 1585. 0247545 M12 x 85 5mm Speak to a specialist on 0115 922 1585. 0247552 M12 x 115 20mm Speak to a specialist on 0115 922 1585. 0247558 M12 x 145 50mm Speak to a specialist on 0115 922 1585. 0247566 M12 x 180 85mm Speak to a specialist on 0115 922 1585. 0247655 M16 x 125 10mm Speak to a specialist on 0115 922 1585. 0247659 M16 x 150 30mm Speak to a specialist on 0115 922 1585. 0247670 M16 x 200 80mm Speak to a specialist on 0115 922 1585. 0247764 M20 x 170 35mm Speak to a specialist on 0115 922 1585.